PDF has now become the most preferred document format to be used in business transactions, which makes a PDF editor essential. However, many PDF editing software make it tricky to edit PDF files online. Here, we've listed the Free PDF editor in 2019, compatible with Windows 10. Annotate PDF Note, Markups, Typewriter, Text Box, Stamps, Highlight, Underline, Area Highlight, Attachment, Shapes, Drawing etc. Note, Markups, Stamps, Shapes, drawing etc. Highlight, Markups, Shapes, drawing etc. Text Box, Note, drawing etc. From the above table, we see that PDFelement stands out above other free Windows PDF editors. PDFelement is an outstanding Windows 10 PDF editor which tops the list. It is a worthy alternative to Adobe Acrobat, which has been widely regarded as the industry standard when it comes to PDF editing. The good thing is that this wonderful PDF editor has a free trial that comes with basic PDF editing solutions. Meanwhile, the paid version offers good value for the cost, as it is affordable when compared to other PDF editors. It boasts of a lot of incredible features which include annotating, editing, and converting PDFs to other formats, add signature and filling PDF forms. In fact, this best Windows 10 PDF editor gives you a complete solution to edit PDF files like never before. Download this simple PDF editor now. PDFelement can do what Adobe can do making it the editor with the best value for money. Users can try it out before they commit to buying it. Its simple design provides a user-friendly interface for both beginners and pros. It is secured with your documents. It has OCR technology which allows you to edit/extract the =PDF files from scanning. The Nitro Pro PDF editor offers many PDF editing features similar to other PDF editors for Windows 10 listed above. Its features include the ability to edit, create and merge, review and collaborate among others. In addition, Nitro editor will allow you to fill, sign and secure your PDF files. It supports all windows operating systems and comes in 2 versions, personal and business. The personal version costs $159.99 and has its own set of more advanced features. There is no doubt that the Adobe Acrobat PDF editor set the pace for PDF editing and is widely regarded as a best PDF editing tools for Windows 10, however, it is considered to be overpriced. It is important to note that PDF editing is not just for large businesses but also for individuals and small businesses, and therefore price is critical. But Adobe is still a great PDF editor with top-class features that helps users convert, edit, and annotate among other functions. System Support: This PDF editor can be compatible with all Windows systems. This is another PDF text editor capable of editing your PDF files in windows systems. Apart from the editing feature, Phantom PDF can also perform other functions including merging and splitting PDFs, annotating and sharing PDF files, creating PDF forms and converting PDFs to other file formats. What's more, you can also add encryption to PDFs, redact PDFs and sign PDFs. Price: It comes in three versions: standard, business, and education. The standard version is $109 in a one-time payment. System Support: It supports all Windows systems as well. This PDF reader and writer may not be as well-known of a software, but it still made it on our list of the best free PDF editor tools for windows. It is also a word processor which means that you can edit files easily like you would with a word document. AbleWord supports to reformat images, add or edit headers and footers, and tables, among other useful functions. It also includes spell check and other functions. Price: This is a free PDF editor. Just install and use. Sejda is a free PDF editor in our list and this is due to its impressive features. It allows you to edit your PDF files easily. Apart from editing PDFs, it can also add signature on PDF files, add comments and links on PDFs, create fillable PDF forms, edit the content in PDF documents. Price： Sejda PDF Editor comes in 3 plans: The web week pass ($5) , the web monthly pass($7.5) and the Desktop+ Web annual pass, which costs $63 per year. The Nuance Power PDF editor for Windows can convert, annotate, edit and add encryption on your PDF documents. As another best PDF editor software, this PDF editor also boasts unique features such as voice note recognition technology. This makes it possible to add notes to your PDF files by simply speaking them instead of typing them out. This PDF editor is regarded as one of the best free PDF editors for Windows because it offers good value for its price. Like other PDF editors mentioned in this list, it enables you to edit PDF documents with ease. When it comes to editing or doing basic tasks in PDF, Soda PDF remains one of the best. Soda PDF comes with three versions: Standard, Professional, and Pro+OCR. However, all versions will allow you to perform editing and converting tasks. The difference between the versions is that some come with more advanced features. For example, the PRO+OCR is the only version that can allow the conversion of scanned PDF document into an editable and searchable PDF file. This is another one of the best free PDF editors in 2018. You do not need to download and install it on your PC to edit PDFs for free. It is a free PDF editor for Windows that allows you to edit PDFs files online easily. There's no need to download a PDF editor, as everything is done online. The features are limited so there are many things you might not be able to do with this editor. For example, you cannot merge PDF files using this tool and you can't use it to create a PDF file. The security and privacy of your documents is a concern with this editor because all edits are done over the internet. PDFescape is another PDF editor for Windows that we thought should be in our top 10. It boasts many features which include editing text and images, merging PDFs, printing to PDF, annotation, and password protection of PDF files among others. It comes in 3 versions: Free, Premium and Ultimate. All three versions have different features and pricing. All plans come with a 15-day money back guarantee. The detailed information above outlined our top 10 best Windows PDF editors by comparing pricing, system support, and pros and cons of each software. You can now make the right choice when selecting the best PDF editor software for Windows 10 to edit PDF files online or offline. 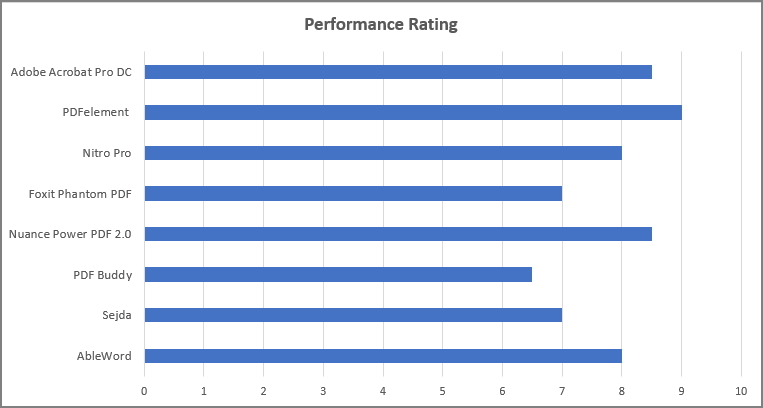 If you still aren't sure which PDF editor is right for you, below is a comparison of the performance rating of different PDF editors that makes it easier for you to make the right choice. After considering the above factors, we've come to the conclusion that PDFelement is the best free PDF editor for Windows 10. It allows you to create, edit, convert and make annotations on your PDF documents, and its range of embedded tools will allow you to work with your PDF files easily. Download the free trial of this simple PDF editor free Windows 10 now. We've outlined the top 10 best free PDF Editors for Windows in 2018. If you have any other PDF editors in mind that you'd like to recommend, please share them with us!